The main aim of the Society’s activity is to ensure human life protection, prevention and mitigation of human suffering during armed conflicts, natural disasters, catastrophes and accidents, support to medical services of the armed forces and public healthcare services, assist public authorities of Ukraine in their activities in the humanitarian field. The Ukrainian Red Cross Society consists of the organizations of national (central), regional, local and primary levels. The National Committee is the organization of national (central) level and it is the executive board of the Society. The regional organizations belong to regional level (Vinnytsya, Volynska, Dnipropetrovsk, etc.) The regional organizations comprise the integral part of the Society and are subordinated to its National Committee. The organizations of local level are city, district and city-and-district organizations that are the integral part of the regional ones and are subordinated to them. Primary organizations (office) of the Society are the organizations of primary level that were founded at the job, living and educational places of citizens who are part of the relevant local organizations of the Society and are subordinated to them. 1918 – On April 18 in Kiev of First Congress of the Ukrainian Red Cross Society was held. This is the date when the Ukrainian Red Cross was established as an independent national society. 1920 – The Society organizes thousands of diners for the poor and provides people with millions of food parcels. 1930 – The Ukrainian Red Cross Society owns 119 medical, 206 preventive and child care centres, a quarter of all TB dispensaries, 36 healthcare institutions, 800 baths, 300 midwifery stations, 400 pharmacies and sanitation and hygiene shops. 1941-1945 – During the World War II, the Society prepares and sends to the front more than 100,000 nurses, health instructors and health brigades. At this time, the Red Cross also initiates free donation. The heroic deed of 17 Ukrainian nurses, who participated in the armed conflict, was awarded with Florence Nightingale Medal – the highest award of the International Committee of the Red Cross. In Ukraine, 23 nurses were awarded with this prestigious global award for exceptional charity in post-war and peace time. 1961 – Creation of the visiting nurses service for medical and social support to vulnerable groups of the population. 1986 – More than 10,000 activists, members of the sanitation posts and brigades of the Red Cross took part in evacuation and resettlement of victims of the Chernobyl catastrophe, provided them with medical and social, psychological and material support. The Society distributed 7,000 tonnes of food, 105 tonnes of milk powder, multivitamins, levotyroksin. 1990 – On the initiative of the Ukrainian Red Cross Society, comprehensive Chernobyl programme was launched. Mobile Diagnostic Red Cross teams carried out inspection of the affected population, raised awareness among the population in the affected regions. To support the humanitarian programmes for the Chernobyl catastrophe victims, the Red Cross movement raised more than 35 mln. US dollars. 1992 – The President of Ukraine issued a Decree on the Ukrainian Red Cross Society, which recognizes it as the only national Red Cross Society of Ukraine in our country authorized to assist the national authorities in their activities in the humanitarian sphere. In the same year, according to the Resolution of the Cabinet of Ministers of Ukraine, the Tracing Service of the Ukrainian Red Cross Society was established. The main objective of the Tracing Service lies in implementation of measures aimed to search and restore family links that were lost as a result of the World War II, other armed conflicts, natural disasters, emergencies and migration. 1993 – The society was officially recognized by the International Committee of the Red Cross in Geneva and became a fully-fledged member of the International Federation of the Red Cross and the Red Crescent Societies. 1999 – The Parliament (Verkhovna Rada) of Ukraine adopted the law ‘On the Red Cross and Red Crescent Emblems in Ukraine’. This law defines the order and conditions of use and protection of the Red Cross and the Red Crescent emblems in Ukraine. 2002 – Adoption of the Law of Ukraine ‘On the Ukrainian Red Cross Society’, which regulates the issues related to the activities of the Ukrainian Red Cross Society, as well as the legal status and legal framework of its activity. 2009 – The Parliament (Verkhovna Rada) of Ukraine ratified the 3rd Additional Protocol to the Geneva Conventions signed in 1949 ‘On the Red Crystal’. 2013-2017. 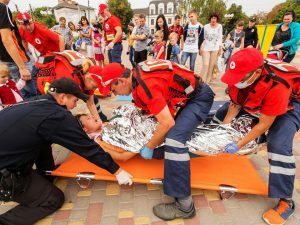 The Society works in a special mode: Emergency Response Teams are created to provide aid to those who were affected during the civil unrest, especially in Kyiv, Kharkiv, Donetsk, Luhansk, Dnipropetrovsk, Kherson, Odesa, Mykolaiv, Vinnytsya and Vinnytsya region. The Society focuses on support to the affected and displaced people from the conflict zone and the Crimea, continuing to provide care to the vulnerable population. The Society is developing the psychosocial support as a direction of its activity. The Ukrainian Red Cross Society cooperates with 21 national societies in the foreign countries based on the cooperation agreements signed. Thus, more than 20 humanitarian programs are implemented annually with the financial support of the international partners. The Ukrainian Red Cross Society is one of the key developers of the strategy for The International Red Cross Movement on preparation for response to nuclear, radiological, biological and chemical emergencies. Special attention is given to cooperation with the international organizations and foundations (such as UNDP, UNICEF, UNFPA, ECHO, WEP, GIZ, WHO, UNHER etc.) as for support of the Society’s humanitarian programs.